For such a massive series, the standard Star Wars action figures have never exactly set the world on fire. The originals had a range of movement last seen at the Nuremberg Rally, and subsequent ones haven't improved much. For 2013, though—and perhaps spurred on by Star Wars' fresh ownership—Hasbro has pulled out all the stops, announcing the "Black Series", a run of figures that will appeal mostly to adult collectors. See: beautiful photos of classic Star Wars figures. Star Wars Action Figures Inducted Into the Hall of Fame. Let&apos;s Celebrate With Awesome Pictures. Instead of the traditional (and under-sized compared to most other figures) 3¾ inches they've stood at for 35 years, the Black Series will be a more contemporary 6 inches. They've also got increased detail, poseability and even fancy new packaging. Selling for $20, they'll be out in August. 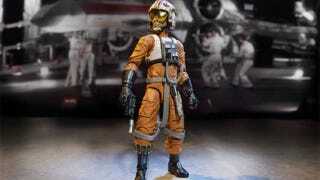 The first figures on the market will be"Luke Skywalker in his X-Wing Fighter flight suit, fan-favorite droid R2-D2, bad guy Darth Maul and an Imperial Sandtrooper." USA Today says it's part of Hasbro exploring options and sizes for the new films currently in the pipeline. Please, Hasbro, stick with this.